Illustration of a Hand Of Glory and how it was used as a candle during a burglary. A Hand of Glory was a tool used by malefactors in the criminal underworld of yesteryear. Think of it like a kind of supernatural roofie used by burglars and other such nefarious bad actors. Taken from the corpse of a hanged man, the hand was dried, pickled and mummified according to a special process and then it made a thieves’ job easier by eliminating resistance from the occupants of house or building they wanted to rob. Some accounts also said they allowed entry through locked doors. 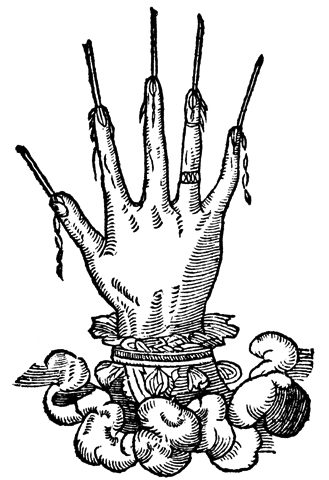 A grisly magical charm popular with thieves in the sixteenth and seventeenth centuries, the hand of glory was a candle made from the dried hand of a hanged convict through a complicated recipe that also included herbs, horse dung, peppers, and salt. The hand would be carefully mummified, and then joined to or turned into a candle using tallow from a hanged corpse. (whether this is from the same corpse is apparently irrelevant). Set alight, the hand is said to have the power to render the occupants of a household insensible, making burglary a simple task. 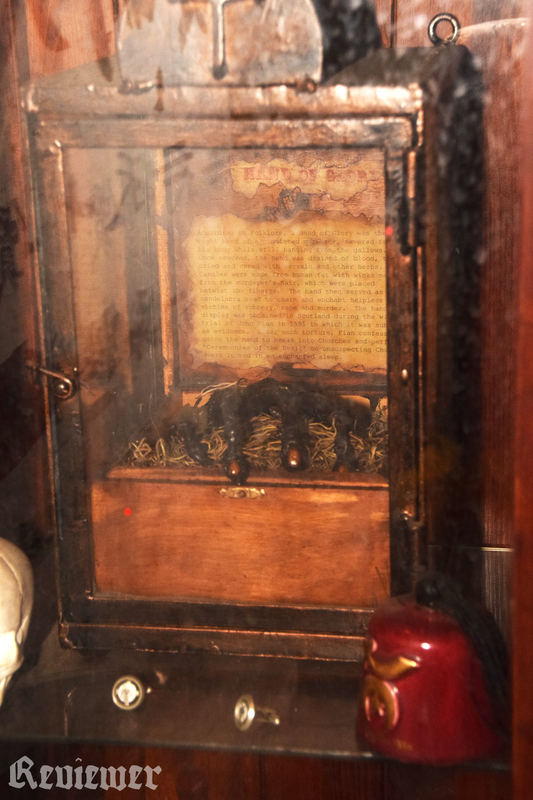 Pictured below: The Hand of Glory under glass and on exhibit at The California Institute of Abnormalarts, 11334 Burbank Boulevard, North Hollywood, California 91601. When asked about its provenance CIA proprietor Carl Crew would only say it was dated from 1709 and of Scottish origin. Asked how he got it, his pointed reply was “I’m an art dealer, man.” Photo by ReviewerPhoto.com. Hand Of Glory, under glass, at California Institute of Abnormalarts. Photo by Reviewer Rob, ReviewerPhoto.com.